Fry Canyon is one of the smaller tributaries of White Canyon, and the only significant drainage that joins on the west side. UT 95 takes a wide bend southwards to avoid the deep section near the junction, crossing near a small settlement also called Fry Canyon (home of 'Utah's Most Remote Desert Lodge', though this closed in 2007), at which point the ravine is just a few yards wide but over 50 feet deep. Fry has a short but nice stretch of narrows either side of the highway bridge and a deeper, permanently flooded passageway shortly before the junction with White, where the colors and patterns of reflected light can be quite enchanting. The gorge only takes 2 or 3 hours to explore but a trip can be combined with a hike down the larger White Canyon, or along nearby tributaries such as Cheesebox Canyon. UT 95 crosses Fry Canyon close to milepost 72, and vehicles may be parked right beside the road bridge. It is easy to climb down here and explore the upper part, but a high drop off above the main narrows section puts an end to easy progress; for those not rappelling, to see this requires walking along the rim, descending into White Canyon then following Fry upstream. 12 views of Fry Canyon. TopoQuest topographic map of Fry Canyon. A faint trail follows the canyon close to the northeast side; the path makes for easy walking on mostly level ground, majority of which is slickrock, part of a typical desert environment that also includes many lizards and some unusual types of cacti. After about 40 minutes (1.5 miles), the trail ascends to the top of a ridge at the west edge of White Canyon. Cairns mark an entrance route, down the outside of a wide bend - descending half way, traversing upstream a little then continuing down a slope to the sandy streambed. The junction with Fry is a few hundred yards to the north, round a bend. 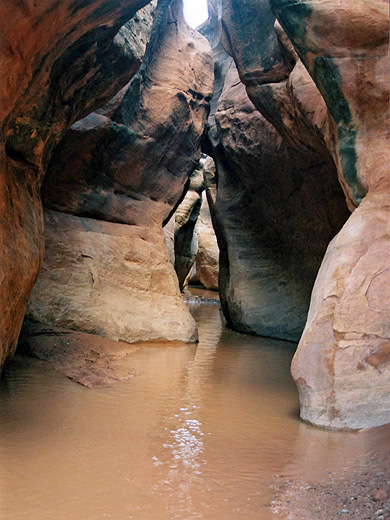 This canyon is not immediately different in appearance but narrows after 10 minutes walking to an enclosed flooded passage which has at its entrance a deep pool of muddy water with gloomy, overhanging, blackish-stained rocks rising high above. The water seems permanent and at most times of year is too deep to wade. This narrows section is unusual and rather spooky, enlivened by eerie, shadowy patterns of reflected light on the walls, and continues for about 100 yards; the extent can be seen either by wading/swimming through the pool or by following above at rim level. 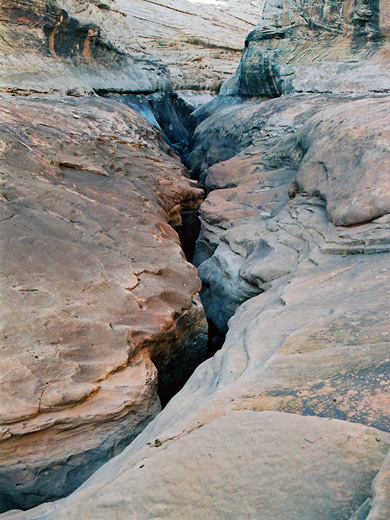 South of UT 95, the wash forms a shallow canyon edged by pretty, light-colored, water-carved rocks composed of thin, swirling strata. The drainage forks after half a mile, the left branch entering a narrow channel that soon ends beneath a pool and dryfall, while the right branch, the main streamway, remains shallow and wide. But the main attraction of this part of Fry Canyon is directly under the highway, where the streamway drops quite abruptly into deeper narrows that are usually waterlogged; climbing down is quite possible, followed by swimming or wading of the cold water, though much easier is to re-enter on the north side of the road, since the slot doesn't last long, and the canyon opens out becoming about 60 feet deep, with mostly sheer walls. The first entry place is on the west side, about 200 feet from the bridge, where a slope and some broken rocks allow for climbing down from the plateau. Once on the streambed, a walk back upstream soon reaches the end of the short, watery narrows, while downstream stretches over a mile of quite open canyon, lacking any obstacles apart from a few large boulders and (after recent rains) patches of quicksand. Several short ravines on either side allow for other climb out routes, before the canyon floor forms a narrow curving slot that precedes a drop of about 60 feet - the start of the lower, enclosed section, for which the usual rappel point is from two bolts in a rock on the right. Above the narrows, in an alcove beneath the cliffs, are several quite well preserved Anasazi dwellings, though these are not easily approached. They can be viewed from above by walking along a dirt track past Fry Canyon airstrip to the edge of the cliffs, starting from UT 95 one mile west of the road bridge.